Just when you all thought I'd completely reverted to smurfs BAM suddenly it's raining green soviet steam powered robots. 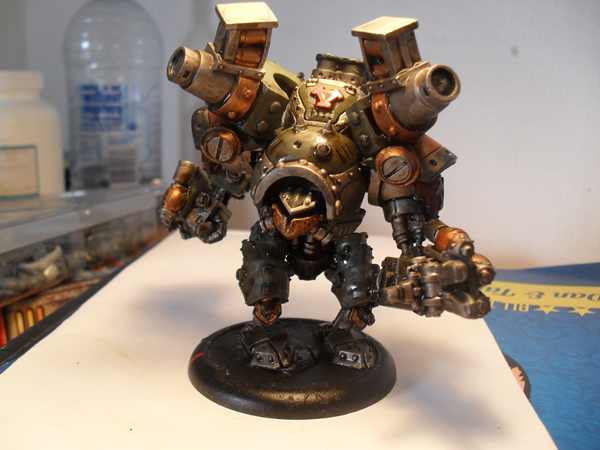 Needing a break from painting up my Sternguard, I decided to ink up my Khador Behemoth, which then prompted some more work after the ink was dry. 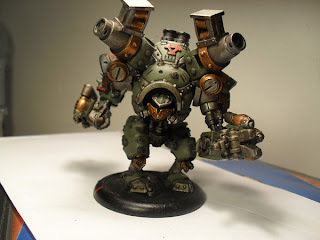 I really love the look of a warjack covered in a dirty ink wash. Here it is after I'd started working the green base layer back up. 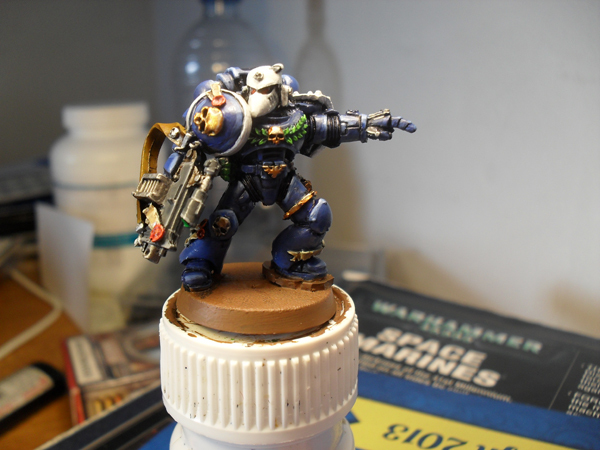 DURING THE MEANWHILE here is the second Sternguard Ultramarine, pretty much finished except for the base. And that's today's work in progress! Is that a war machine miniature? I've really wanted to paint some of their stuff. Decent quality? Great work on the stern guard so far dude, keep it up! Indeed it is, from the Khador faction. The models are great quality, if you check out the Icons Machina link at the top of the blog I've put the rest of my Warmachine models up that I've done so far. Definitely recommend the game too, I'm not a huge wargamer but I greatly prefer the Warmachine system over 40K. That's quite interesting, I never even really considered playing. I suppose with privateer being GWs main competitor their game would have to be good. Have you played any Hordes as well?